In this article I will show you how you can bind image to a webgrid in an mvc application using c#.net. 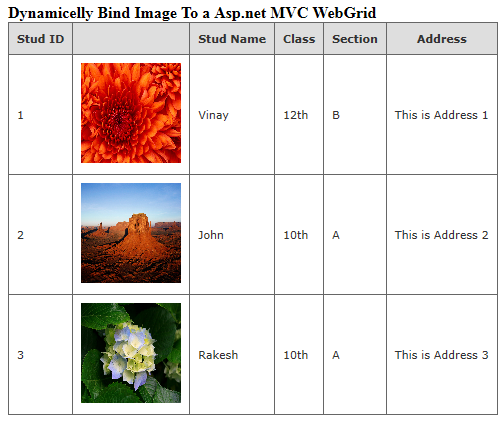 In this we will use to bind the image data to image control present in the mvc webgid. This article we can use in mvc3, mvc4, mvc5. 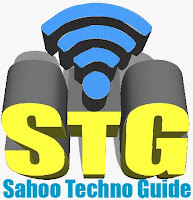 In my previous article I have shown you how to do MVC WebGrid Custom paging With Page no and Shorting Data Using C#.Net, How To Disable Sorting in Asp.net MVC Webgrid, How to Bind Data to Webgrid in ASP.net MVC Using C#.Net. 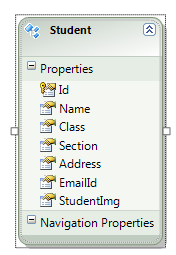 After this we will add an entity file in our application, after adding .edmx file we will add the table into our entity file. Now we will create a model file, and add the below code into this. Now we will add controller in our application. In this controller add the below code. Now we will create view of the controller and add the below code in the view. In above code we have added image in webgrid. Now run the application to view the output.